Quidnessett Memorial Cemetery honors more than 1,350 Veterans resting within the gates. 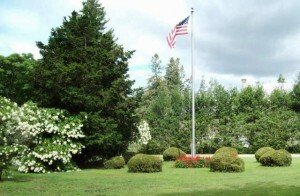 It is important to let your Funeral Director and cemetery know if your deceased loved one is a U.S. Veteran so we can help you apply for and obtain the below free benefits available at private cemeteries for burial purposes. The U.S. Government not only provides free markers to all Veterans who served honorably in the U.S. Armed Forces, but also keeps track of where Veterans are buried throughout the Nation by all those who received Standard Government markers after 1997. To locate the burial cemetery of Veterans you may know, search the database Nationwide Gravesite Locator. Likewise others will be able to locate your Veteran after you apply for and receive a Government Marker.